Dr. Michael Farzam of House Call Doctor Los Angeles is happy to provide the urgent care West Hills residents have long wanted but likely thought didn't even exist. 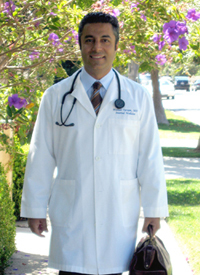 As one of the few home visit doctors in Southern California, Dr. Farzam is delighted to give a service that San Fernando Valley and Greater Los Angeles area patients need. Whether you need urgent care at your home or office West Hills, Dr. Farzam can give you the friendly medical care that comes directly to you, rather than you having to brave the West Hills streets when you're feeling ill. The San Fernando Valley is filled with many busy residents, and the urgent care West Hills want is a simple phone call away, with House Call Doctor La. If you have an acute health problem, or find yourself feeling ill and would rather not stress yourself by driving the LA streets only to have to wait hours in a busy ER waiting room, Dr. Farzam provides the best solution: 24 hour urgent care that comes to you. It might surprise you if you find out that on-call doctors are able to come to your home, office, worksite, or any other location, and that it may even cost far less than a trip to the emergency room, but this is often the case. Urgent care West Hills residents can rely on is found with Dr. Farzam. With House Call Doctor Los Angeles, urgent care in West Hills or anywhere else in Greater Los Angeles never needs to be a hassle. For further information call 310-849-7991 today or visit our contact page.